Why Is My Butterfly Bush Not Blooming? How Many Hours of Sun Does a Butterfly Bush Need? Is Butterfly Weed an Annual or a Perennial? Prepare your perennials for winter to ensure a vibrant showing in spring. Winterizing butterfly bushes (Buddleia davidii) provides for the plant's safety and continued health during its dormant phase. Winterizing butterfly bushes requires only a small amount of time, and the effort will pay off when the plants return in the spring with beautiful, fragrant blooms. Remove any debris and weeds growing around the base of the butterfly bush. Cut the butterfly bush back to around 4 feet tall, or all the way back to the ground. Hardy perennials, butterfly bush will enter a dormant phase during the winter in most planting zones. The best time for a final pruning of butterfly bush is late fall. 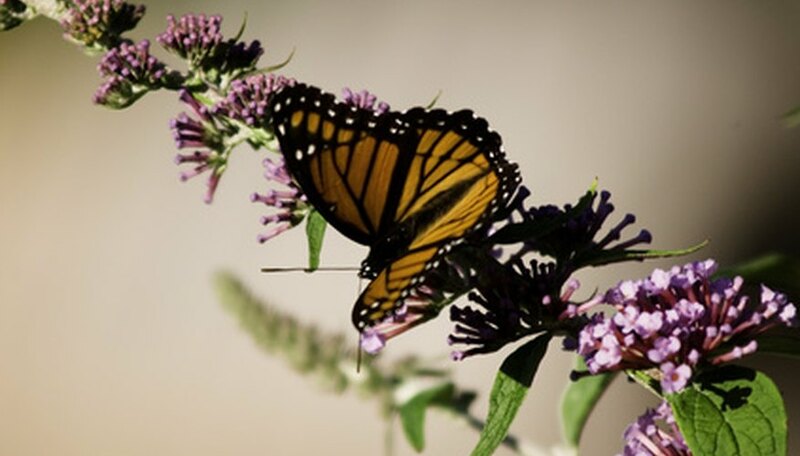 If you choose to trim the butterfly bush back to ground level, placing a stake or other type of marker at the site to remind you of its location when spring arrives. Add mulch around the base of the butterfly bush to keep roots from drying out over the winter. A sun-loving perennial, butterfly bush roots are more prone to rot. Too much mulch on the root system can promote rot so apply only a thin layer of mulch around the plant. Use a variety of natural items for mulch, such as sawdust, leaves, wood chips or grass clippings. Arrange mulch to within 1 to 2 inches of the base of the butterfly bush. Dispose of any pruned branches and any weeds pulled from around the butterfly bush. Shred them for mulch or throw them onto a compost pile. Break up any large, woody branches before composting. The butterfly bush grows quickly and needs open space in a sunny location with well-drained soil for best blooming. The butterfly bush needs at least six hours of sunlight a day. In shady conditions the plant does not get enough sunlight to produce full bloom clusters. The butterfly bush needs about an inch of water a week in the summer to bloom. The typical butterfly bush blooms on new growth. When the plant is not heavily pruned, new growth is sparse with few blooms. According to Clemson University, the butterfly bush benefits from a layer of mulch and moderate fertilization for flowering. Pinch off spent blooms so the plant puts out blooms on new branch tips. Rake back in early spring any leaves that have accumulated around the base of the butterfly bush and any mulch that was applied the previous season. Cut back all the branches to the ground, using pruning shears or a hand saw. Toss the branches into a compost pile to keep decay away from the base of the tree. Removing all the wood will force the plant to produce new wood and larger, more prolific flower heads. Plunge a garden fork into the crown of the butterfly bush about 4 inches in from the outer edge, facing outward. Jump on the fork and pull it back to loosen the roots. Lift the section from the crown and set it on the ground close by. Fill in the hole left by the removal of the division with new soil, tamping it down to prevent drying out of the crown. Take several divisions from very large crowns, leaving at least a 4-inch diameter for the original crown. Plant the new divisions immediately in a hole as deep as they were previously, in a sunny spot with good drainage. Apply about 1/2 inch of water and wait for new growth to emerge. Clip back the stems of the bush to only 4 inches tall if you live in a southern region with mild winters and normally above-freezing temperatures. Make a horizontal cut with your hand pruners. Cut the entire bush back to the ground if you live in a northern region where the butterfly bush normally dies back completely over the winter and temperatures stay below freezing. Add mulch around the base of the butterfly bush 2 to 3 inches deep after the first frost to insulate the roots of the plant over the winter months. Watch for new growth in the spring. Provide an annual treatment of slow-release granule fertilizer when new growth sprouts. Butterfly bushes are marginally root hardy only to Zone 5. A mound of soil around the crown of the plant may help protect it. The plant should be cut back to within a few inches of the ground in the spring. Butterfly bushes grow best in full sun and well drained soil. Inadequate drainage can result in root rot caused by Phythium, Phytophthora or Rhizoctonia fungi. Infected plants should be removed. The drainage and air circulation should be improved before replacing infected plants. Caterpillars and Japanese Beetles eat the leaves and flowers of Butterfly Bushes. Remove by hand or apply an insecticide approved for butterfly plants according to the manufacturer's directions. Spider mites can be washed off with a hose or treated with a pesticide approved for butterfly plants at the recommended rate of the manufacturer. Mineral deficiencies in the soil can cause discolored or distorted foliage on Butterfly Bushes. An excess of minerals can cause leaf tip dieback and discolored leaf edges. Soil should be tested to determine whether fertilizer is needed and how much to apply. The butterfly bush tolerates both full sun to partial sun locations in the landscape. Full sun areas receive six or more hours of direct light each day. Partial sun garden sites feature four to six hours of sunlight each day. The blooms of this shrub appear on new wood. Full sun exposure ensures abundant blooms during the summer growing season. With correct siting of the butterfly bush, mature plants reach up to 8 feet high and wide. Full sun plants require consistent exposure to sunlight. Monitor surrounding shrubs and trees to ensure that the butterfly bush receives plenty of light. A mature landscape can create pockets of shade as tree canopies expand. Prune tree foliage or move the plant to a sunny location to reap the benefits of this shrub. Take the time to prune back dying blooms on this shrub. Deadheading rejuvenates the butterfly bush and promotes blooming continually through the summer. Prepare the growing area. Work the soil to a depth of at least 5 inches and add 1 to 2 inches of compost. Work the compost completely into the soil. Rake the soil smooth. Plant the seeds 1/4 inch to 1/8 inch deep and water lightly. If you are planting the butterfly seeds in a bed with other flowers, place the seeds toward the back of the bed because the plants can grow as tall as 3 feet. Fertilize the plants once or twice during the growing season to enhance blooms. Follow the fertilizer package recommendations for the size of your growing area. In successive growing seasons, fertilize the butterfly weeds several weeks before the expected blossoming. Water butterfly weeds sparingly. These plants only need additional moisture during drought conditions. Prune the shrub all the way back to the ground in the spring. The butterfly bush produces flowers on new wood and it is beneficial to get rid of old growth. Make sure the butterfly bush receives full sun. If the shrub receives less than six hours of sunlight, transplant it to a more appropriate place. Deadhead old blooms. Once the blossoms are spent, snip them back to the closest set of leaves to encourage new growth. Fertilize your butterfly bush in the spring and fall with an all-purpose fertilizer. Follow the directions on the fertilizer. 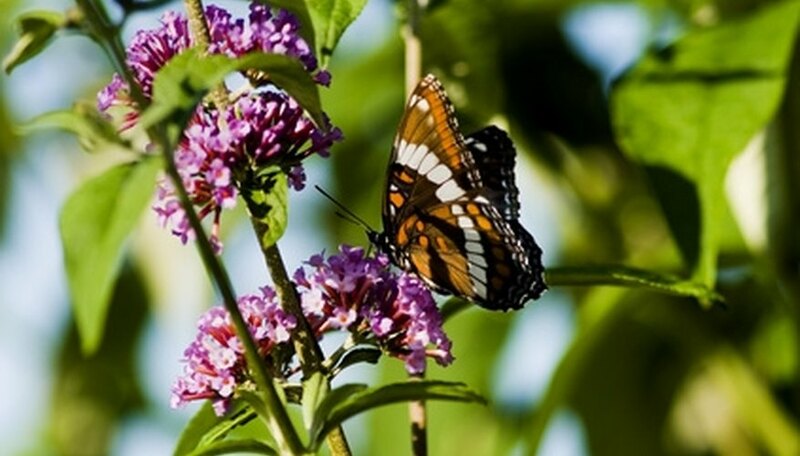 Trim back the butterfly bush in late winter or early spring while the bush is still dormant. Pruning earlier during the winter may lead to injury from cold temperatures. Use the pruning shears for smaller branches or the lopper for larger branches and cut back the butterfly bush to between 6 and 12 inches above the soil level. Discard the stems and branches in a compost bin or in the garbage. According to both the New Perennials Club and the Burpee online catalog, butterfly bush is a perennial.